More than 25 million Americans attend thousands of art walks, gallery openings, and other arts events every year ... and now they will have an app designed specifically to meet their needs and enrich their experiences. Launching July 4, 2016, Art Walk America (AWA) will be available in both an ad-supported free and a $1.99 version. AWA is a product of its parent company, MOV! AWA beta tester sign-ups are being accepted now at www.ArtWalksAmerica.com prior to the Independence Day launch. The initial version of the AWA app will feature 8-10 major cities across the United States, with a wider focus planned in stages throughout the third and fourth quarters of 2016. For more on the Art Walk America app, go to https://youtu.be/IJ720rYaOyo. Art Walk America is the brainchild of MOV! CEO and Art Walk America Creative Director Gloria J. Fredricks, who is an oil painter, sculptor and interior designer: "As an artist who seeks to connect with fellow artists and others who appreciate the arts, I have been keenly aware for years now of the need for a means by which the arts and the public can come together more fully and with greater ease. Not only will Art Walk America bring more people to the arts, it also will provide important opportunities for those who support the arts to demonstrate that and, perhaps most importantly, for artists to find a market for their works." The primary appeal of AWA is simple: A user-friendly way to search, find and make the most of art-related events, including art walks, gallery showings, and other culinary, fine arts, music, and fashion events. AWA will feature live streaming video from art walk events, as well as AWA user submitted photographs, reports, and reviews. Event organizers will be able to self-submit content about their events and the featured galleries and artists. Additional content will be curated by AWA, sponsors, event organizers, and AWA users. Supported by The Hastings Group, Art Walk America will make use of the latest in technology to bring together the public, events, artists, event organizers, and sponsors. The ad-supported Web site and free app will feature events searchable by city and personal location, as well as dates, times, maps, gallery information, and other content. The $1.99 version will be ad free and offer such enhanced features as live, step-by-step maps, a "concierge service" (restaurants, B&Bs, parking), special gallery tours, talks by artists, access to special events, and other premium features. Gloria Fredricks said: "No one should ever have to wonder again whether or not there is a local art event available to them. No one should ever have to feel like a stranger when they show up at an event. And no one should ever have to worry that they didn't have the richest and fullest experience as an attendee. Our goal is to make Art Walk America a win for everyone ... the general public, event organizers, sponsors, gallery owners ... and, most importantly, the artists who make all of this possible." MOV! is currently beginning to speak to organizations interested in supporting the mission of Art Walk America, including planned foundation activity such as art in the schools, art camps, art competitions, and the promotion of art around the world. Gloria J. Fredricks is a resident of Washington, D.C., Minnesota and Arizona. For 10 years, she has been a full-time practicing artist, with a focus on plein air oil painting, figurative drawings, photography, sculpture, fashion design, and the culinary arts. Fredricks ran an interior design firm for 15 years. Her works have been featured in a variety of shows throughout the U.S. and have been sold to collections internationally. She is member of Landscape Artists International, International Plein Air Painters, and a signature member of Northern Plains Artists. MOV!, the parent company of Art Walk America, is the growing center of a number of new brands and services designed by artists for artists .and those who appreciate the arts. MOV! products and services evoke strong responses from their users. MOV! will move you. Follow Art Walk America on Twitter at @LaunchAWA and Facebook at www.facebook.com/ArtWalksAmerica/. I just tuned into Stephanie Marango’s new book, "Your Body and the Stars," published a few weeks ago by Atria Press, an imprint of Simon and Shuster. It can be purchased at Barnes & Noble or through that little outfit owned by my Cuban peeps... Amazon. 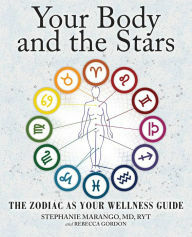 Even though this is an art news outlet, I get a lot of books sent to me to look at... and let me affirm that this is the first book of its kind – a fun, practical and insightful handbook that takes a revolutionary approach to wellness by showing the relationship between the twelve Zodiac signs (e.g. I'm a Virgo) and the specific body region each sign represents (e.g. the Upper Back and Heart). Stephanie is a holistic health physician and educator, and her collaborator, Rebecca Gordon, is the resident astrologer for Harper's Bazaar. While new to modern times, the relationship between health and astrology actually dates back to Babylon and forms much of the history of medicine and science, from Plato, Aristotle and the school of Hippocrates, and all through the history of Rome, and weaves all the way through medieval times. How can you apply this ancient wisdom to your life? Pick a body part (e.g. neck) or a star sign (e.g. Taurus), and read how to bring your well-being into greater balance including practical tools like self-directed questions and yoga/Pilates/strengthening exercises for an effective result. And I think that artists can learn a lot from the other arts, especially those with ancient roots, that seem to reach and tickle each individual cell, as though each cell is tied to each floating bit of energy in the Universe. Even though I get a lot of unsolicited books to review, as you constant readers know, seldom do I wander away from the art world, but this is a good meander -- You can find the book at Barnes & Noble as well as my bud Jeff's Amazon... you can read and enjoy it now... and learn. Whether or not you believe in astrology, the book’s an exceptional read, weaving in mythology, history and health - and that's how it hooked me in. I think that you'll find it a welcome exercise at expanding your perspectives and further opening your mind to "what if?" Read it! Use it! Art it!